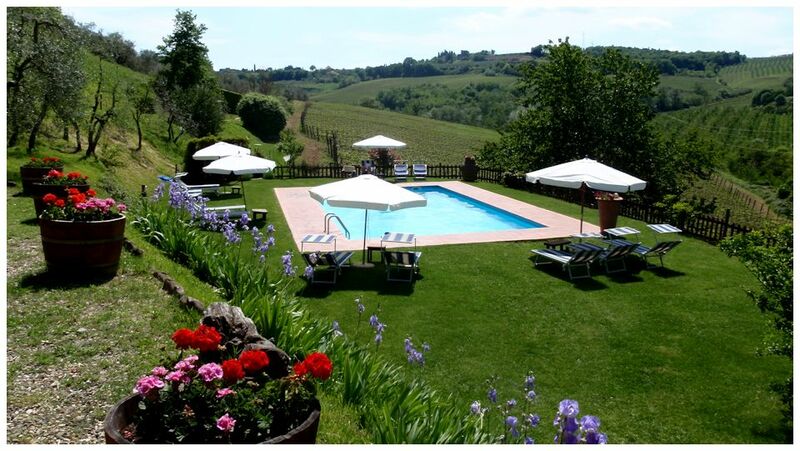 At our family farm there is a swimming pool (12×6 metres), surrounded by a large garden overlooking the valley, from where it is possible to enjoy an enchanting view of the surrounding hills. Here each apartment has its own umbrella with deckchairs and sunbeds. In our swimming pool, the water is slightly salted with no added chlorine, and thus more delicate for skin and eyes, in addition to the environmental benefits. Franco and Daniele will be glad to welcome you to our ancient cellar to walk you through the main steps of the wine-making process and to taste our organic wines alongside local specialties. At our family farm there is a wi-fi network with ADSL connection, which covers most of the outdoor spaces and part of the indoor spaces. For kids we have a playground with a slide, a swing and a wooden playhouse. For those of you arriving in Tavarnelle via bus from Florence or Siena, we are happy to pick you up at the bus stop in town and drive you the 3 Km to the farm. If at the end of your trip to Il Bacio you want to relax, we can provide groceries for you upon arrival. Please send us your order at least 48 hour prior to your arrival. The service is free of charge. Upon request, in the morning we will deliver to your door fresh bread and an international newspaper of your choice among those available in Tavarnelle. The service is free of charge. Our guests have a common washing machine at their disposal. Within a few minutes from our family farm there is a wide selection of restaurants, trattorie and pizzerie, where it is possible to enjoy regional and local specialties. The closest bike rental service is 4 Km away. There is a stable 3 Km away, from which it is possible to take wonderful horseback rides. For those interested in taking an exciting ride in a hot air balloon to enjoy a beautiful view over the Chianti hills and towns, a company with qualified pilots is only 4 Km away. Around 25 Km away there is a magnificent golf course with 18 holes.